Cleaning Up CherryFramework’s Malware Installer | What is Going On? Recently, an old client contacted me because emails were not being sent from their Godaddy hosted wordpress site. A quick look at the folders in their webroot made it clear that the site had been hacked and most likely the emails not working was a side-effect of godaddy noticing and blocking their email function. As you can see from the above, which is the first version uploaded to git, the ONLY checking this file does is whether or not you are sending it some files to upload and telling it where to send it. So, it conveniently lets you upload any file to any directory on the webserver. Similarly, their download-content.php file also let you download arbitrary files from the webserver, with 0 checks in place to prevent abuse. You can see a screenshot of the github repository here. 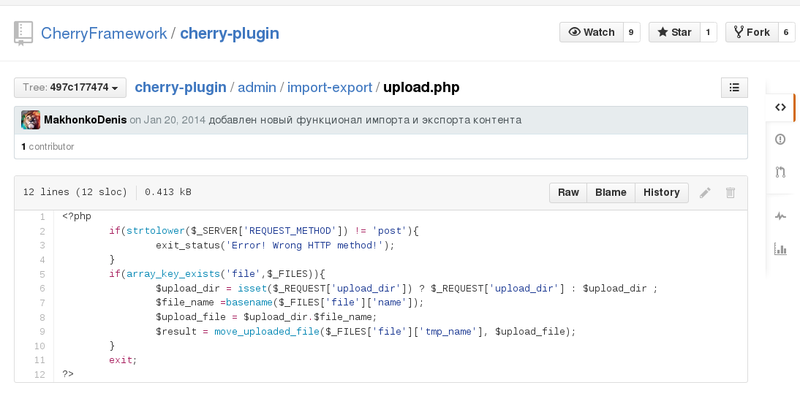 This was fixed in later versions of CherryFramework and shows that the developer better understands wordpress now, as they not only implement a nonce and checks the logged in user’s capabilities by calling current_user_can, but also adds the code to an ajax action rather than just a malware installer like it was before. Everyone makes mistakes and it is easy to miss something that can be abused…mistakes happen, get fixed, and we move on. But, something like that or SQL queries written with 0 thought to injection blow my mind.